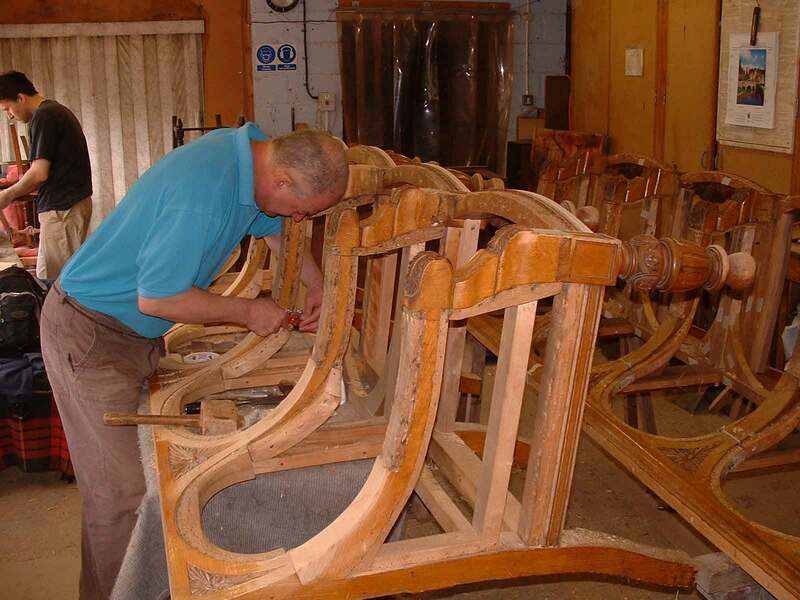 With years of experience and expertise, our craftsmen have had the privilege of repairing, restoring and conserving a variety antique and period furniture for different clients.At Lomas And Pigeon, we aim to serve our customers past and present with a personal service, skilled craftsmanship and sound advice. William Pigeon is a full member of the British Antique Furniture Restorers Association as well as the Association of Master Upholsterers and Soft Furnishers.We are always working with individual clients who need single items of furniture restoring, polishing or upholstering. 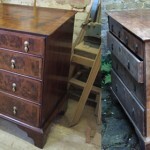 The image above is an example of a chest of drawers, before and after restoration, this item required completely restoring following a severe flood. As well as individuals, we look after private collections, local authorities, museums, London Embassies and have just won a tender to look after the furniture, clocks, textiles and metal work for the Palace of Westminster. Below is an image of our craftsmen working on a large project for Waltham Forest Borough Council.